Scheduled Tasks enable you to automatically perform routine Active Directory administrative tasks on a periodic basis. You can use them to automate a variety of actions, including adding and removing members from groups, moving objects to appropriate Organizational Units, handling inactive user and computer accounts, sending email notifications, etc. 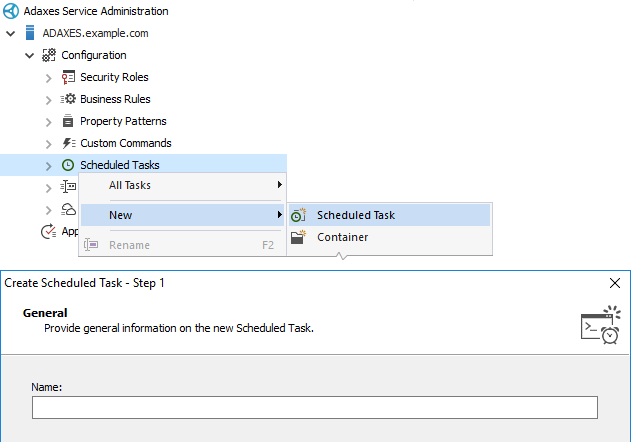 This tutorial provides step-by-step instructions on how to create and configure a Scheduled Task. It is recommended to use nouns to name Scheduled Tasks (e.g. Membership Manager, Location Updater), because tasks will appear as operation initiators in the Adaxes Log and approval email notifications. Select the type of objects on which the task should be performed. For example, if you want the task to add users to groups, or execute Custom Commands on user accounts, select the User object type. Specify what actions the task should perform. To add an action, click Add an action. Actions executed by Scheduled Tasks can be submitted for approval. For example, you may want inactive user accounts to be disabled only after an approval is granted by the user's manager or an administrator. To request approval for an action, select the Get approval for this action option and specify the approvers. To add more actions to the task, right-click a condition/action set and click Add Action in the context menu. 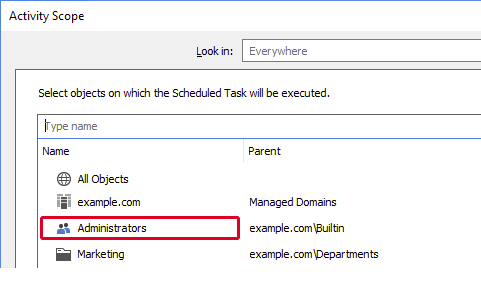 On the Activity Scope page, you need to specify which Active Directory objects the task will be executed on. A Scheduled Task can be executed on all objects in a domain, objects located in specific Organizational Units, members of groups and Business Units, etc. To define the scope of activity for the Scheduled Task, click Add. All Objects - select to perform the task on all objects of the specified type in all domains managed by Adaxes. Specific Domain - select to perform the task on all objects of the specified type within an AD domain. OU or Container - select to perform the task on the objects located under an Organizational Unit or container. Group - select to perform the task on members of a group. Business Unit - select to perform the task on members of a Business Unit. To select a Business Unit, open the Look in drop-down list and select the Business Units item. 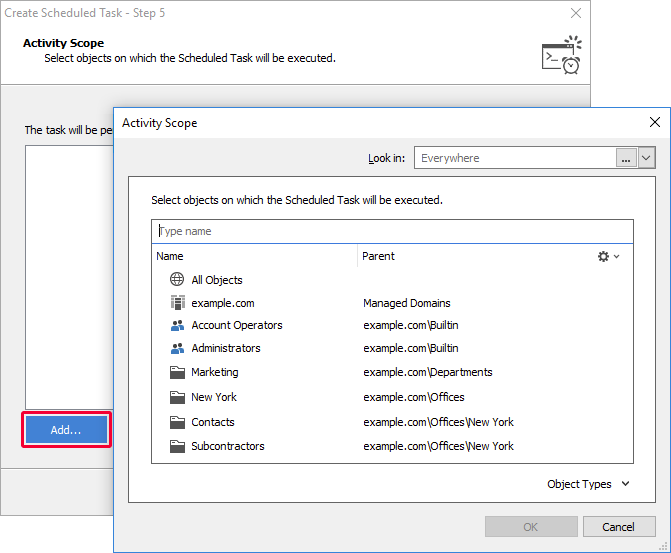 You can exclude specific objects, groups, Organizational Units, Business Units and domains from the activity scope of the task. 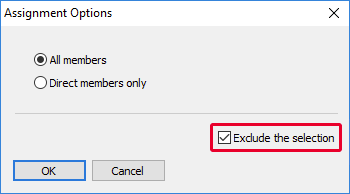 For example, if you've assigned the task over all objects in a domain, but do not want it to be executed on members of a certain group, you can exclude the group from the activity scope. To exclude an object, select the Exclude option in the Assignment Options dialog box. Example 1 - Add all users located under a specific Organizational Unit to a group. Example 2 - Move user objects between OUs. Example 3 - Remove disabled users from all groups. 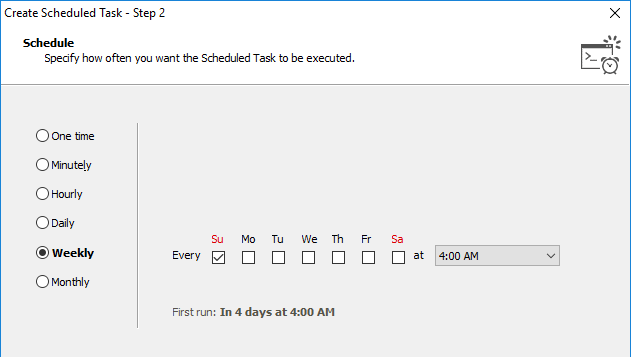 For information on how to create scripts for Scheduled Tasks, see Server-Side Scripting. 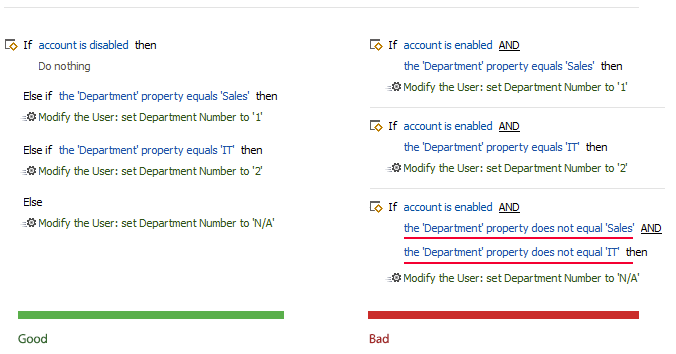 Example 4 - Update the Description property using a modification template. Example 5 - Send email notifications to users with no mobile phone specified.